From Concept to completion Longbow Sales can provide design consulting, superior products, installation and services for all products in any size of athletic facility. If you are looking to modernize, maintain or add to an existing facility we can assist you. Porter & Gill Athletic along with All American Scoreboards offer a complete range of athletic equipment for both indoor and outdoor use. Ceiling mounted, wall mounted, fixed and outdoor units. 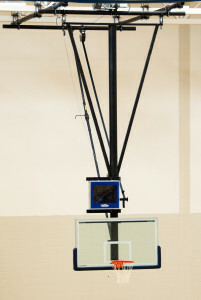 Accessories such as backboards, goals, edge padding and shot clocks. From recreation to high level competition along with accessories. Floor Sockets – Hardwood and synthetic floor applications in a variety of sizes. Football, soccer, lacrosse and field hockey. Impact and fire rated options available. Multi game and game specific. Accessories such as Ad panels, name boards, Score-tables. Call us or click the link below for more details.